stilzitten is de beste bescherming tegen pijn. Blijf binnen. oppervlakkig ademend steeds kleiner oprolt tot ze in zichzelf verdwijnt. laat los, waait steeds verder van de kern, maar waait, beweegt. from the desperate darkness troubling his bones. Sadness. is to question everything—humanity, peace, poverty, power. He holds these things with fingerless gloves and grace. the infinite above us. He sees things that we don’t. with clean clothes, new car smell, bills, anxiety, and fear. Before you read, let it be known that we were inspired in two ways. 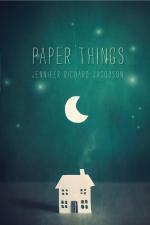 First of all, we were inspired by the book Paper Things by Jennifer Richard Jacobson. It is an incredible book! Our second inspiration came from Brian Wilhorn @HelpReaders, who put together a similar visual guide for the book Wonder by R.J. Palacio. We decided to compose our own version for Paper Things, which is another must-read. Thank you to Michael, Bella, Trey, Emma, Jezlyn, Shae, and Rowan for doing the research and the hard work to put this together.